“The University’s goal is to harvest knowledge, not timber." The University of California Center for Forestry is based on the UC Berkeley campus and has as its mission "to sustain forested ecosystems through scientific inquiry." When California's largest public utility, Pacific Gas & Electric (PG&E) filed for bankruptcy in 2004, they gave up a massive amount of forest and watershed land (appx. 140,000 acres) they had managed since the 19th Century. 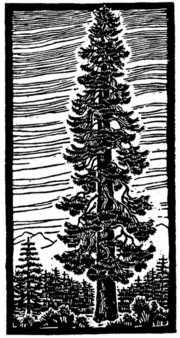 A state committee was formed to decide who would take over stewardship of the lands in question, and UC was one of the successful candidates, largely because UC shares the goals expressed in many public comments, which stressed the value of intact forests, tall trees and wildlife habitats. The primary research that will be conducted on the mountain land concerns the effects of climate change and maintaining ecosystem stability. UC already holds just over 5000 acres of research forest in California, so the recent donation will double their holdings when they take possession in 2012. 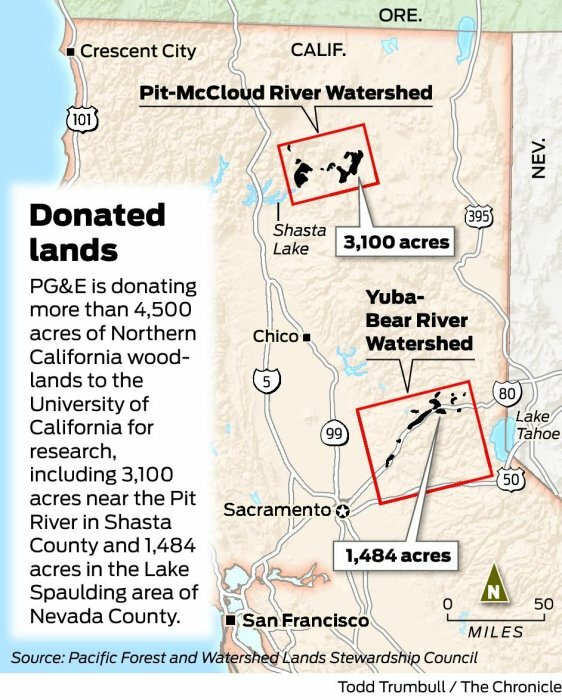 “This four-and-half-thousand acres is a tiny portion of the total PG&E lands, but it’s an enormous boon to UC’s research and outreach capabilities." Here at Biotechnology Calendar, Inc. (BCI) we're particularly interested in the Nevada County acreage because it's in our backyard, so to speak. Our headquarters in Grass Valley in Nevada County sit at about 2,000 feet above sea level, in the foothills of the Sierra Nevada Mountains; Lake Spaulding, at appx. 5,000 feet, is about a 35 minute drive up into the mountains and forms part of the watershed for our community and much of the Sacramento Valley. If you ever wondered who the account reps are you talk to on the phone, and the event managers you meet at our events, we're hikers and kayakers, mothers and fathers, theater-lovers and sushi enthusiasts, dog-owners and chicken-coop builders, scientists and novel-readers, all involved in our local community as well as the bioresearch world that is the focus of our professional lives. We're not surprised that UC was chosen to steward our forests and those in Shasta County. Here in California the University of California system is a powerful and important entity economically, scientifically, and educationally. Our staff includes UC graduates and parents of current UC students, and our UC campus product expos constitute a substantial percentage of our business, and we imagine, yours. The laboratory for bioresearch that these lands will constitute may contain more conifers than centrifuges, but sometimes to think big you need to climb to the top of the mountain and look out. If you are interested in attending the UC Berkeley or other are event as an exhibitor or researcher register here.